With young student at National Yunlin University of Science & Technology, Taiwan, 2000 - who thought she was meeting Santa Claus. 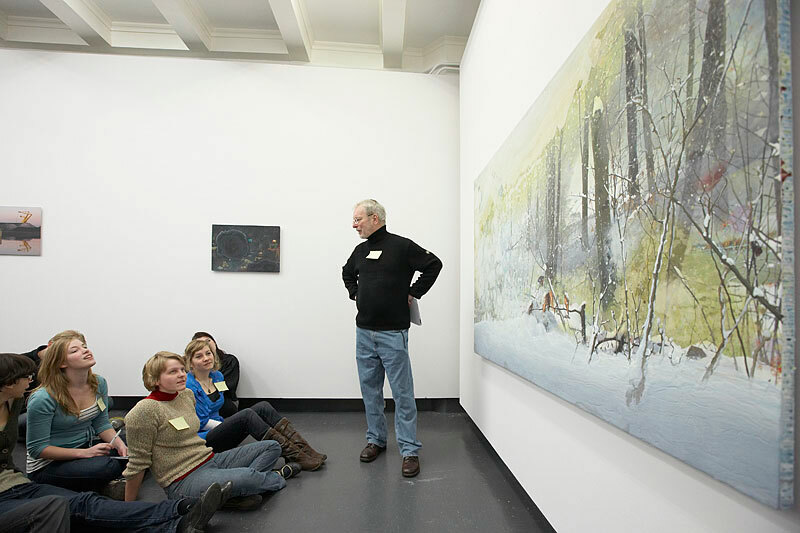 Gallery teaching workshop for student teachers. Amsterdam, The Netherlands. College for Creative Studies, Detroit, Michigan, February 12, 2014. "Appreciating the Work of Hubbard/Birchler: No Room to Answer,"
Modern Art Museum of Fort Worth, Texas, November 15, 2008. "Appreciating the work of Joseph Havel,"
Dallas Contemporary Museum of Art, October 18, 2008. Wexner Center for the Arts, The Ohio State University, October 20, 2006. Hope Arts High School and RISD, Providence, Rhode Island, August 22, 2006. Art House, Cleveland, Ohio, February 16, 2006. University of Michigan, Ann Arbor, September 25-26, 2006. Cleveland Public Schools, Ohio, October 26, 2005. 9th Annual Iranian Photography Biennial, Tehran, Iran, July 28-29, 2004. Terra Museum of American Art, Chicago, March 27, 2004. University of Memphis, Tennessee, February 16, 2002. "Criticizing Art with Children: The Paintings of Jane Hammond,"
Cleveland School District, Center for Contemporary Art, Ohio, January 8, 2002. Talkeetna, Alaska, May 17-19, 2001. Summer Media Institute, Ohio Arts Council, Ohio University, Athens, July 23-29, 2000. "Inspired by Family Photographs, Catalysts for Teaching Reading & Writing," Providence City Schools, Rhode Island, March 16, 2000. Minnesota State Department of Education, Golden Valley, January 21, 2000.
with Susan Michael Barrett, Indianapolis Museum of Art, Indianapolis, October 11-13, 1999. "Interpreting Photographs: Rineke Dijkstra, Wendy Ewald, Paul Seawright," Nederlands Foto Instituut, Rotterdam, September 15-17, 1997. Midwest Society for Photographic Education Conference, Detroit, November 5-6, 1993.